The Nora Salon: La Fonda is April 13th! Our next gathering of The Nora Salon is Friday, April 13 and we are excited to be featuring the latest piece by friend of Nora’s, Suzanne Trauth (Francoise, Rehearsing Desire). We hope you’ll join us for a glass of wine, friendly conversation, and an informal reading of Suzanne Trauth’s full length play: La Fonda. 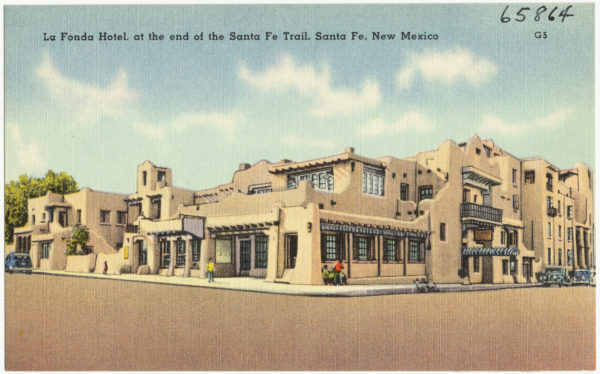 It’s 1945 in the bar of the La Fonda Hotel, in Santa Fe, New Mexico, thirty miles from Los Alamos. People from the town meet to drink, gossip, and trade theories about the activity on the Hill, where the scientists of the Manhattan Project are developing the atom bomb. It is a moment in history when many in this desert town have secrets. Who can be trusted? The bartender? The traveling businessman? The German-born operator of a rooming house? Not to mention the presence of Russian spies… In the midst of the political turmoil, a young Los Alamos engineer falls in love and, torn by a battle between his patriotism and his conscience, is forced to confront a future that might threaten his family. THIS GATHERING OF THE NORA SALON IS CURRENTLY FULL. Please email us at reservations@norasplayhouse.org to add your name to the waitlist. Should any spots open up, we will let you know asap!